Below is a set of documents which explain the Shehab Foundation - a comics, cartooning based co operative. I was discussing it with a few peers. and sadly, its still under discussion. Although here's the full document in case the idea dies on the drawing board. 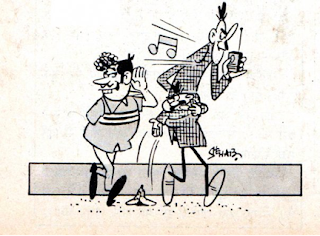 Shehab was a Mumbai based Comic artist famous for his characters “Lambu-Chotu”, He also did various work for various different Comics and Magazines at that time. This January I made a call at the Diamond Comics office to get his address so that I could invite him to Comic Con. They told me that He’s dead, plus there’s no point sending an invite because he used to live in a chaal, was unmarried and had no direct relatives. So, we would never know what really happened to him, if he died from a disease, poverty, anything else. Since then this idea has been running through my mind. Social Security for the professionals involved: There’s no social security of any sort for the professionals involved, by social security I mean the word in all broad possible meanings, basically a support structure. Old timers, newbies, everyone is just on their own. An illustrator lives, dies, is going through a rough period, doesn’t matter to anyone, not even his industry peers. Why would then anyone want to do enter this Comics/cartooning business? Everyone is, in all senses, on their own. Limited Content/Limited Audience – Why should we even call this an industry, when the difference between two graphic novels is a gap of 2-3 years. When there’s not material coming out, how can we expect to add new audience to the medium. There are these fixed people, who know all the new Indian graphic novel/comic releases, but we’re not adding new audience to the medium. We need to bring out new material more often. Training/Resources – There are little or no training resources for the young ones, no fixed way of going about it, no direct courses anywhere, nothing to help them. And even if we say he/she cracks through, there’s no platform to improve your skills, discuss the craft, improve it. The idea is to create one fund, a cash reserve fund. This fund organizes activities across the year, in the areas which fall under these three major problems. Fund raising can be an annual acitivity for the fund. What is this idea about ? The idea is to create a small fund, which we can mobilise towards the help of contributing members, or the old timers. Who would this fund cover? This fund will cover all members, i.e people who donate to the fund regularly. Fund focuses on cartoonists, illustrators and artists. But it also covers animators, vfx artists, and motion graphic artists under the broadest end of the spectrum. Old timers, who are not covered under the fund are a bigger priority and the main focus would be to rush this fund for their help. What will we do in this kitty club? We will mostly make sure that no old timer and no member gets to live on the street due to his choice of profession. - A halo to show. What would be the structure of this organization? Co-operative, with an election ever year, sounds boring but that’s the best way out. Every member gets to vote or contest. The main body has a small number of members who then manage the organization. There is a constitution to this organization under the rules of which the organization works. We can even get a PAN card for the fund, under which every donation is tax exempted. Where do we get money for this ‘corpus fund’? Donation from the members, a monthly donation, heavy in the beginning and lighter in the end. This will be the backbone during the initial stages of creating the fund. Donations – Donations, voluntary from the people who employ us, members can bring this up as a genuine cause with their clients to get some money in, obviously this will come later, after the fund is more visible. General Fundraising – An annual activity, which can be a dinner, workshop or seminar for voluntary fundraising. Invitees could include Ad Agencies, publishers, studios and famous artists. Special Fundraising – specially organized for a specific artist, who needs the support urgently. What does the money do all this time? This fund grows or it sits idle? How much time will this activity eat? Not much, in the beginning setting up things will eats some, but later it’ll run smooth. The priority would be to keep it low key to avoid conflict with work. I am a rich/poor, well/badly paid illustrator? Why should I be interested in samaj sewa? Its not a plain charity, because its not for slum dwellers or poor tea vendor kids. So while I pay a small amount every month, I am sure that when a real life threatening emergency strikes, I have a support system at the back. At the same time I get to meet new peers and share knowledge. Whats the future of this fund? Later as the fund grows we can provide help/loan, for situations of at the lower extreme, like scholarships etc. Why Am I so interested? Earlier the story of Shahab was only of romantic sad interest. But that was before I quit my recent job, over an issue. It was completely unplanned and I had no savings, I had to take some money from my parents and keep my brain in one piece to work for two long months before work started coming in. It gave me a taste of how would someone feel in an amplified, family supporting illustrator scenario. I want this not to be a fanboy incestuous club, I am interested in this to be a crystal clear strong fund, which provides real help. I am even ready to get Sarnath Banerjee to support us. I am “that” serious. Do you know anyone in the family of Artist Shehab. We would like to donate grand funds to his family for his work. Young Blood infuses energy in everything !